okay, I know what you’re supposed to drink on Saint Patrick’s Day…Guinness, Jameson, car-bombs. But, honestly, we drink all those things year round. This St Patty’s, in celebration of Monika landing a full-rime job, and for something green to drink, I got us something special. Perhaps in the future, I’ll blog exclusively about Absinthe, but for now, for tonight, I suggest we spare the history and simply imbibe. The classic Hemingway Cocktail is two ingredients, Absinthe and Champagne. It was apparently one of his favorites, but, there’s very few cocktails you can’t find that weren’t either Hemingway’s or Faulkner’s favorite libation. 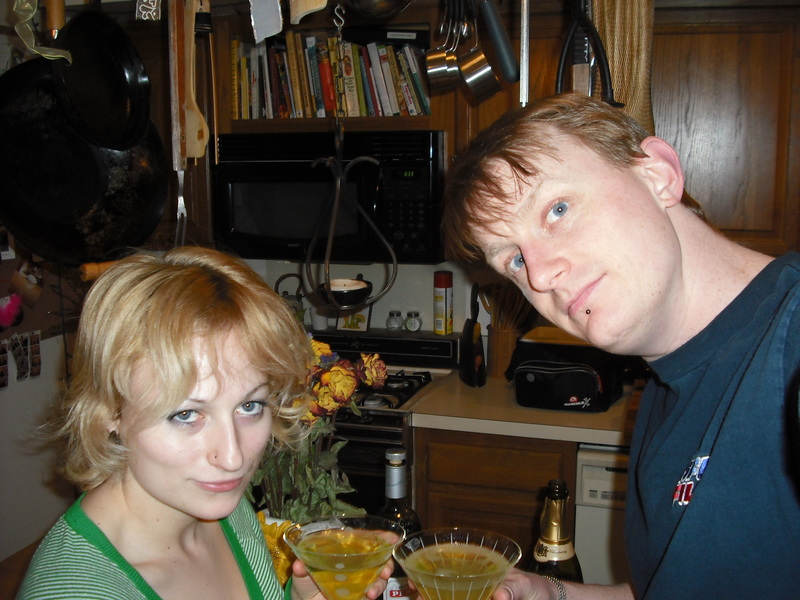 Absinthe is some pretty bitter stuff, and damn strong, so you’ll need some advice making this cocktail. First, a cube of sugar, caramelized, will sweeten the bitterness. The way to do this is with an absinthe spoon, or some sort of very small colander. 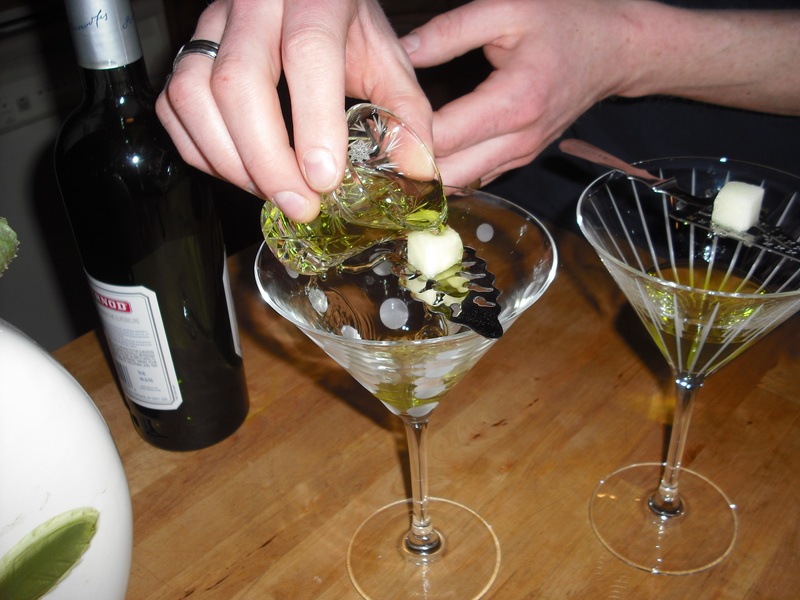 Pour a shot of absinthe over a sugar cube place on the slotted spoon and into the glass. Next, you light the sugar cube on fire. This melts the sugar, caramelizing it, and making it easier to dissolve in the absinthe. Be careful, though. Absinthe is high proof. 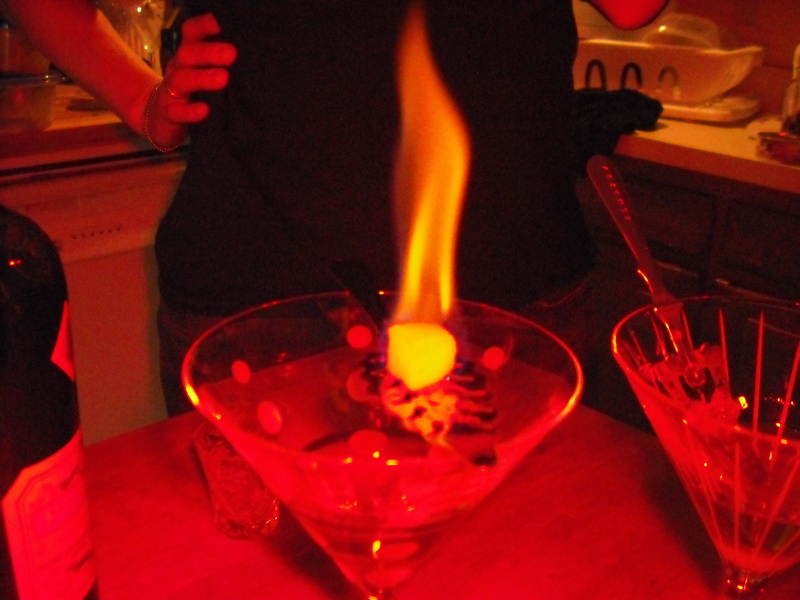 The Pernod we were using is a lofty 136 proof, and therefore, extremely flammable. If the sugar starts to drip, while still on fire, it will ignite you glass of absinthe. It’s not dangerous, but it will not only heat up your glass (actually, we used crystal, but all the same), but will also burn off the precious alcohol in your cocktail. While inhaling the vaporized alcohol can be fun, I suggest you quickly life the spoon and gently blow out the ignited cocktail should this unfortunate incident occur. Once the flame goes out, use the spoon to stir in the sugar. The rest is easy. 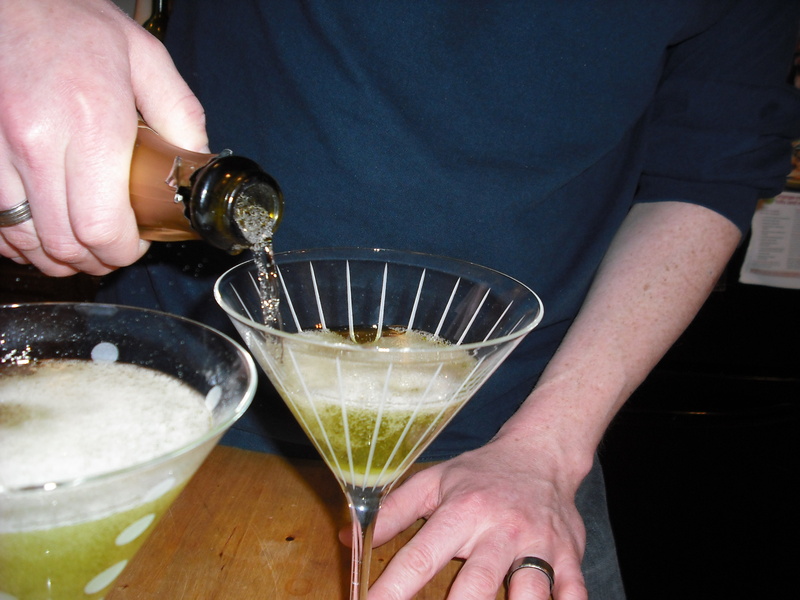 Top off your martini glass with some decent Champagne. 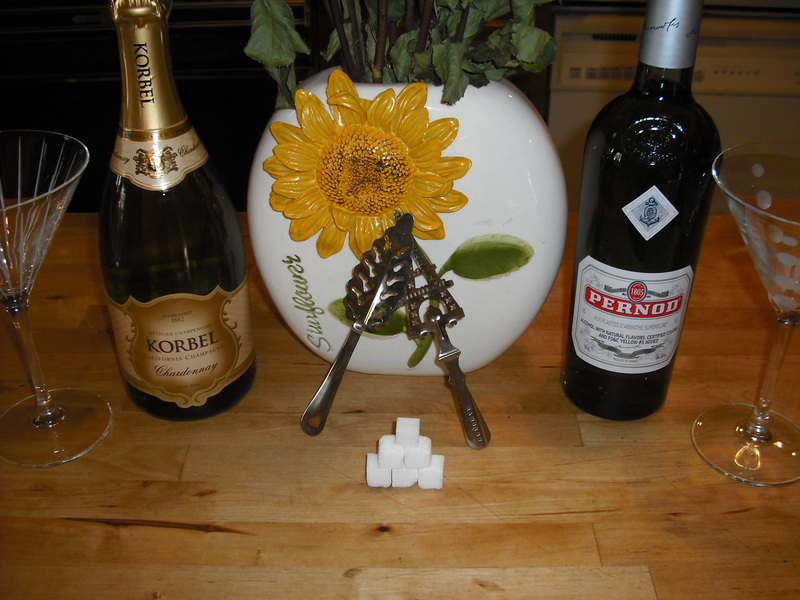 We used a dry Korbel, not too expensive and not too candy sweet. It’s green, delicious, filled with a ton of demon spirit, and delicious. This entry was posted on March 17, 2010 at 6:39 PM and is filed under Good Times. You can follow any responses to this entry through the RSS 2.0 feed. You can leave a response, or trackback from your own site.